Pie. I’ve always had mixed feelings about this classic dessert. Ya see, I’m not one to swoon over warm fruit. However, I do love a good coconut cream pie and have been known to enthusiastically indulge in the banana cream variety. When brainstorming ideas for this year’ last Holiday Recipe Exchange, I knew I wanted to step out of my specifically-cream-pie-loving box and step into the realm of fruit. But, not just any fruit pie would do – I wanted it to be festive and full of cozy winter flavors. I remembered bookmarking a Pear-Cranberry Galette from Simply Recipes and after briefly reviewing the recipe this weekend, I knew it would be perfect for this pie themed recipe exchange. 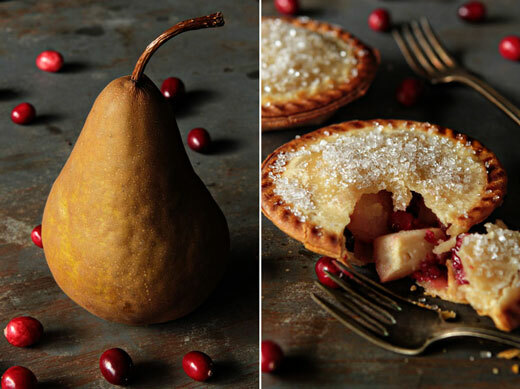 Roasted Bosc pears blend perfectly with the sweetness of vanilla sugar and the tartness of fresh cranberries to create a dessert that will be just different enough to stand out from the standard apple pies, but familiar enough to please all the traditionalists at your table. 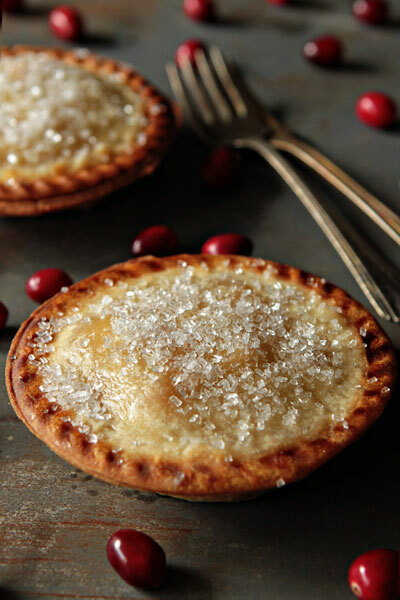 Adding in a little ginger, cinnamon and cardamom gave these adorable pies a seasonal flair that would be perfect finish to any holiday party. Join Katie and I this week in sharing your favorite Pie Recipes for a chance to win a Personal Pie Maker from Breville. Be sure to check out her recipe for Individual Chicken and Vegetable Pot Pies. I want to thank each and every one of you that participated in the 2011 Holiday Recipe Exchange. We truly appreciate your contributions and have enjoyed browsing your incredible recipes. 1. Preheat oven to 400°F. Line a roasting pan with aluminum foil. 2. In a large bowl, combine the pears, cranberries, ginger, vanilla sugar, cardamom and cinnamon, tossing to coat evenly. Spoon mixture onto prepared pan and spread into an even layer. Dot the top with butter. 3. Roast for 1 hour or until the pears are tender when pierced with a fork, and starting to get brown and caramelized around the edges. Remove from oven and let cool. 4. Use a slotted spoon to remove the pears from the roasting pan, and place in a large bowl. Stir in almond extract. 5. Prepare pastry bases and tops according to manufacturer’s directions. Divide filling amongst the four pie wells. 6. Close lid and cook for 8-10 minutes or until pastry is golden brown. 7. Remove the pies with a plastic heat proof spatula and cool slightly. 8. If desired, before serving, lightly brush the tops of each pie with melted butter and sprinkle with coarse sugar. If you do not have a Breville Personal Pie Maker, head over to Simply Recipes for the recipe for a full size galette. Write and post a recipe on your blog featuring PIES. Include “Come join the fun at the My Baking Addiction and GoodLife Eats Holiday Recipe Swap sponsored by Breville” in your blog post. Submit your post before December 26, 11:59 PM. Love any of the recipes featured in today’s Holiday Recipe Exchange? If so, be sure to to use the Ziplist Web Recipe Clipper to add your holiday favorites to your online recipe box.